I'm generally not big on hard, dry cookies...or "biscuits" if you must—but these crisp caramelized treats are one of a handful of exceptions to that rule. My initial impulse was to compare these cookies with Barnum's Animals crackers, which everyone knows are the creme dela creme of the animal cracker kingdom, far superior to even those with nifty pink frosting that come in giant bags. These biscuits reflect the quality and good taste of the Barnum's Animals, but possess a slightly more complex flavor. There's an essence of gingerbread present—and the word "caramelized," used on the packaging, has a certain propriety in this case, so long as you're not thinking of caramelized onions as I unfortunately do whenever I hear the word "caramelized." After trying several of these dessert-ish biscuits, I was overcome with a shameful impulse... I wanted to put Speculoos Cookie Butter on them. And I did. For those of you with a severe simple sugar deficiency, that combo may well just be the cure that you're looking for. It's intensely sweet and gingery, and it'll send your system into sugar shock in the blink of an eye, and will cause a four-alarm fire in your mouth that only a good glass of milk can put out. Hours later, independently of me, after just a bite or two, Sonia was struck with the same impulse to slather her biscuits with cookie butter. Like me, she quickly satisfied both her contemptible culinary craving and her recommended weekly allowance of sugar in one fell swoop. Flavor-wise they're winners, but again, their dryness begs for milk or coffee or tea. Did you ever, just sheerly out of curiosity, try a dog biscuit in your youth? I know I did. And it was never the taste that revolted me, it was always the texture—the dryness. It's like that with these Bistro Biscuits, except that they're way better than most dog biscuits. Both texture and flavor. Way better. I guess the dog biscuits are a really bad comparison to make. Nevermind that then. Please disregard this paragraph. Sonia liked them a lot. With or without cookie butter. She gives them a 4. They remind her of actual British biscuits. She's had the real thing. I'll give them a 3. They're tasty little buggers, but again, I don't think they're particularly great as a stand-alone food. Check them out if you're into the whole "dunking" thing. And definitely try them with cookie butter, but have extra insulin standing by. P.S. - These biscuits are vegan. These sound like TJ's version of Speculoos cookies, which is probably why you wanted to put that spread on them. So sad if they do get discontinued because they have become part of my morning coffee break routine. Of course you have to get used to the heartbreak if you fall in love with any TJ product. Anything Vegan is tough to see go. I know the options are limited out there; especially for low-priced, decent quality Vegan snacks! A dramatic markdown usually spells out discontinued, so consider stocking up while you can. Sad sad news. :( Thanks for the update. Oh darn! I just discovered these and they are the BEST. Just like the Biscoff cookies that Delta gives out. These are Speculoos cookies, same as Biscoff, both made in Belgium. Our Tj's still has the bistro biscuits, but Lotus, the Biscoff distributor, also sells at CVS and other retailers! I was blown away today when I went to trader joe's specifically to pick up my three packs( I always bought them like that so I would not have to make so many trips in a month). 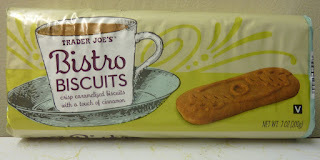 I too looked for the taste of Biscoff and my search ended with the Trader Joe's Bistro Biscuit... So sad... I am in Woodland Hills CA does anyone know of any stores that would still have them?